• Suitable for air handling spaces, ideal for installation of WAPs and IP devices. • Cover snaps on easily and can be removed for adds and changes. • Boxes have knockouts on 3 sides to mate with HellermannTyton’s TSR single channel raceway in 3/4” and 1-1/4“ widths. • Suitable for air handling spaces, ideal for installation of WAPs and IP devices. • Cover snaps on easily and can be removed for adds and changes. • Boxes have knockouts on 3 sides to mate with HellermannTyton’s TSR single channel raceway in 3/4” and 1-1/4“ widths. The Surface Mount Boxes feature a compact low-profile outline. They are ideal for retrofit situations and where internal wall access may not be obtainable. 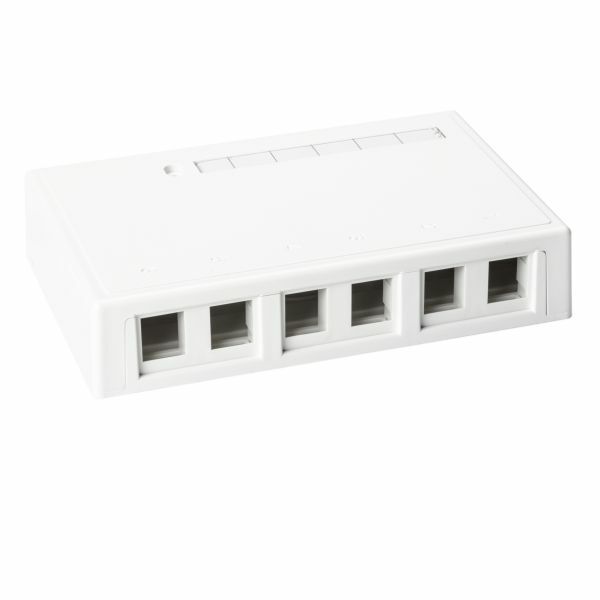 Designed for use with HellermannTyton’s modular jacks and various multimedia modules, the surface mount boxes are easy to install and can be fastened to any surface. Jacks sold separately.